Get Your Riddim and Heavy Dubstep Face on at the Black Box 1/11/18 w/ Bommer + Crowell + many more! “Death Before Dishonor” tour is coming to the Black Box on 1/11/18 with a handful of big names that are widely known in the heavy dubstep and riddim scene! 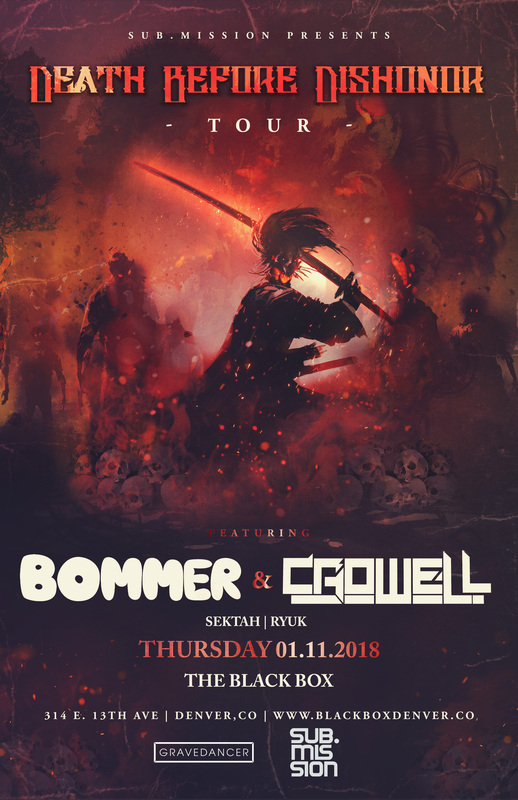 The tour is composed of Bommer and Crowell with local support from Sektah, and RYUK! Coming from St. Louis, the 25 year old dubstep producer has made a name for himself across the scene with several gnarly dubstep releases on massive labels such as; Smog, Prime Audio, Subquake Audio, Octane Audio and more! One of his more popular songs is actually a collaboration with Crowell, who also gained a decent amount of followers with the legendary song, “Yasuo.” Yasuo happens to be one of the characters that you can play as on an internet game, League of Legends, which gained the attention of many gamers who get down to dubstep music. This track has been an absolutely massive hit at clubs and festivals around the world! The song has been remixed and mashed up by some of the biggest names in the industry! Having the originators of this epic track along with dank local support at one of the biggest underground bass music venue’s in Denver is just calling for all the bassheads. Don’t miss out on this show and grab your tickets below! This entry was posted in Event Media, Music Reviews, News, Previews & more and tagged Bass, Dubstep, Filthy, Grime, Riddim. Bookmark the permalink.